Do not buy a Toyota Corolla. Do not let your loved ones buy a Toyota Corolla. I know you can't stop them. Something about a jelly bean with mediocre performance, outdated design, and crappy features is just too damn appealing to them but you must prevent it. Get them to buy a Mazda3 or a Ford Focus or a Hyundai Accent or literally any other compact car. People associate the Corolla with value, just as they do the Civic. That for the last few years they're actually not the best value hasn't seemed to change that impression. In theory, this will last forever. 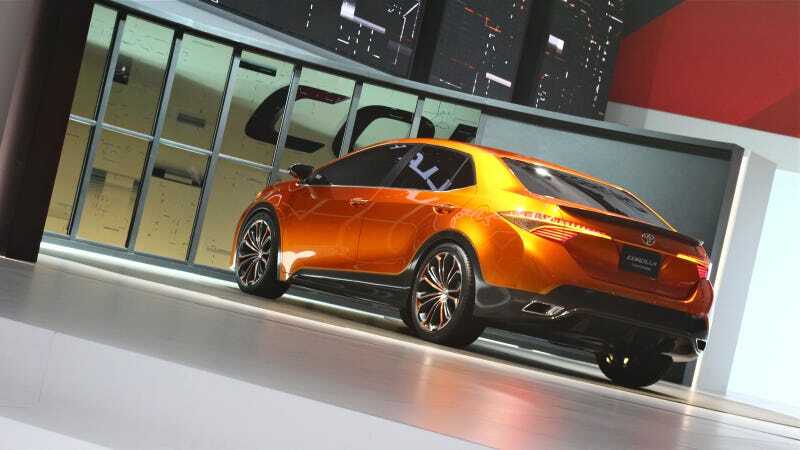 I take the Toyota Furia Concept as good sign then that Toyota is actually trying. They could make another boring car and sell, as Honda continued to do with the Civic despite our complaints. Someone described it as a Scion FR-S sedan, which it isn't, but it's certainly worthy of a once meaningful name. The profile is aggressive, with a steep front clip and windshield transitioning into a kinked greenhouse. Did I just use the word "aggressive" to describe a Toyota compact concept? I did. The design language utilized on the nose, which is miserably sleepy on the 2014 Toyota RAV-4, somehow works with the whale tail grille. Fancifully, there's carbon fiber on the spoilers and rocker panels. Previously, you'd have gotten more use out of a pencil sharpener than carbon fiber on a Corolla, but this is the future. Realistically, the new Corolla may not be any sportier than the old one. It may not be a Mazda. The words "sporty" didn't come up. The key here will almost certainly be connectivity and tech. Not our ideal, but we'll forgive them if they can give us more than what we expect and not just more than what Ford used to offer.